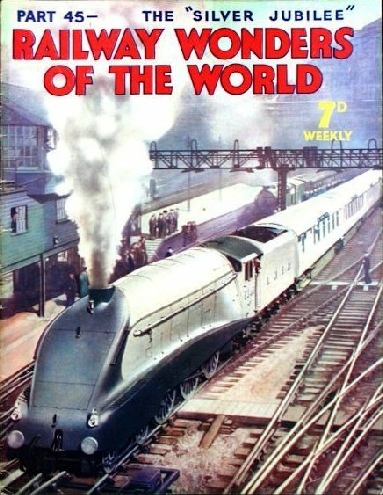 This site is designed to share information about the magazine Railway Wonders of the World. 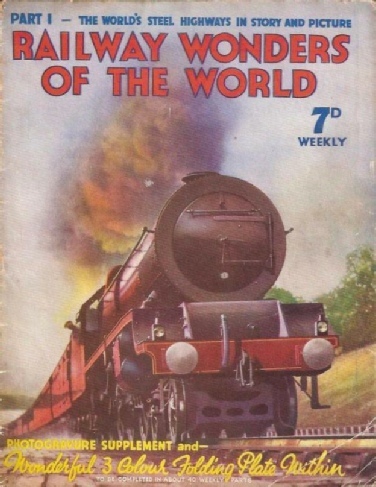 Published by the Amalgamated Press, Railway Wonders of the World appeared in 50 weekly instalments from 1st February 1935 through to 10th January 1936. A vast range of subjects was covered. The complete work was designed to be bound in two hardback volumes which are still readily available. Others chose to retain the weekly parts with their attractive colour covers. Today the weekly parts are more difficult to obtain but do appear from time to time. On this site you can review information about all of the 50 issues, and explore the content of this fascinating magazine using the various links provided. All the covers, colour plates, black & white art plates can be viewed, along with extracts from the photogravure supplements. Information about the editorials and the advertising used on the covers is also incorporated into the content. A number of themed pages are listed which add depth to the content, such as the themes Famous Trains or Design and Invention. More general information is also posted here, such as biographies of the Editor, Clarence Winchester and of the Consulting Editor, Cecil J. Allen.